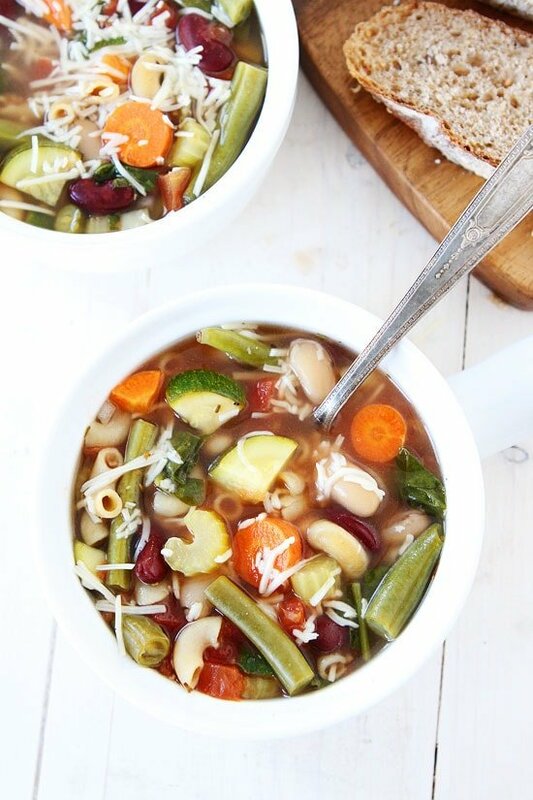 Slow Cooker Minestrone Soup-this easy slow cooker soup is loaded with vegetables, beans, and pasta. It is great for lunch or dinner! Our slow cooker has been getting a workout this month. We’ve made our Slow Cooker Sweet Potato Vegan Chili twice and now we are on a Slow Cooker Minestrone Soup kick! I love this soup because it is hearty and very filling. Sometimes Josh will want more than just soup for dinner, but not when we have Slow Cooker Minestrone. It is loaded with veggies, beans, and pasta. There is lots of goodness going on in this soup! You really don’t need anything else, well, we like to serve it with crusty bread because carbs…duh, but that is it! This soup makes a great meal! We haven’t gotten much snow this winter and it is really bumming Josh out. He has been skiing quite a few times but is craving some fresh, deep powder! I am not a fan of the cold and snow, but I do know we need the snow! I would rather have the snow now than in June. It seems like our winters are getting later and later every year. Plus, soup and snow just go together. I am hoping if we keep making this soup the snow will come…for Josh’s sake. And I really do enjoy watching the snow from inside…under a blanket, with cozy socks on, and a warm bowl of soup! 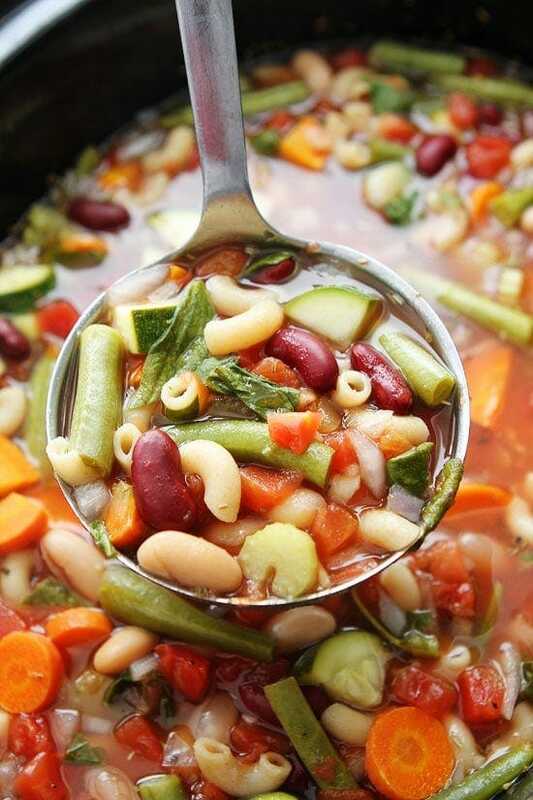 This Slow Cooker Minestrone is the perfect cold weather meal. It is loaded with lots of healthy veggies, beans, and whole wheat pasta. It will warm you right up and if you are feeling under the weather, it will help you get better too! Yay for delicious food that is good for you too! We like to serve our minestrone soup with freshly grated Parmesan cheese. If you are going the vegan route, you can just eat the soup plain. It is plenty good on it’s own. If you need the soup to be gluten-free, you can use gluten free pasta! We use whole wheat elbows, but you can use your favorite small pasta! This soup is very adaptable! 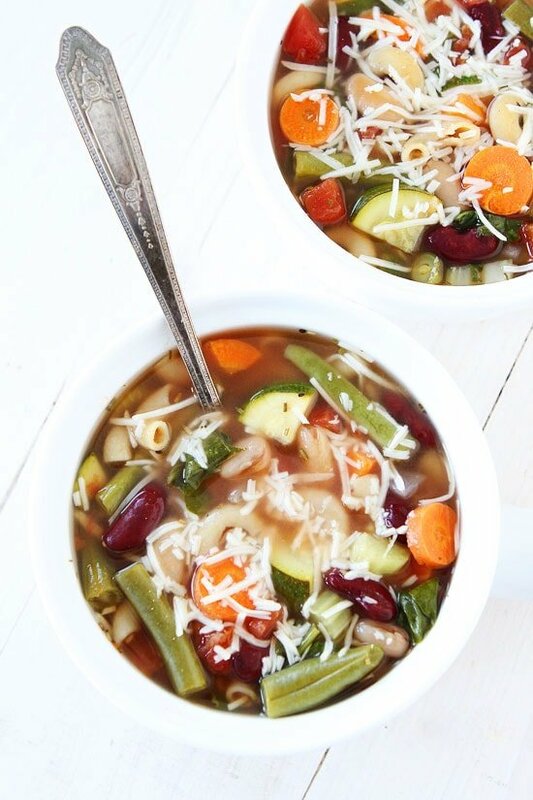 Get out your personal chef, your slow cooker, and make this Slow Cooker Minestrone Soup! It is the perfect soup for a cold and hopefully snowy day! 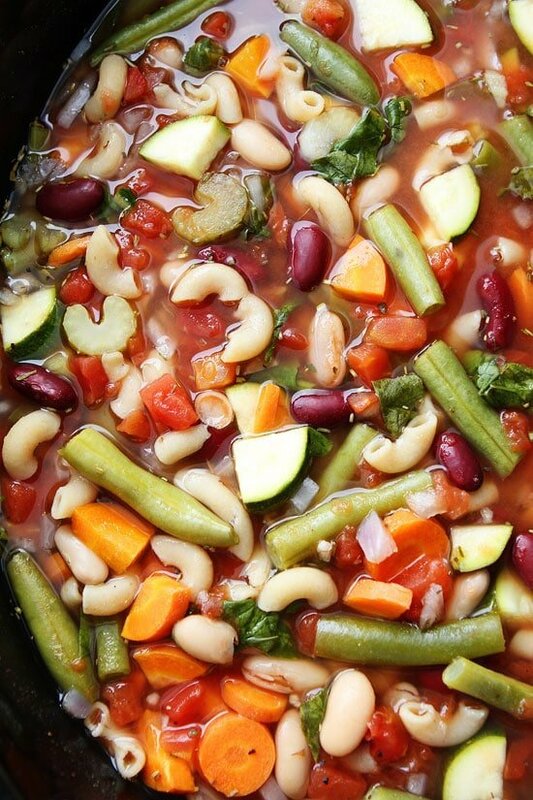 This easy slow cooker soup is loaded with veggies, beans, and whole wheat pasta! It is the perfect meal for a cold day! Combine the onion, carrots, celery, garlic, green beans, tomatoes, broth, and beans in a 6-quart slow cooker. Add the bay leaves, oregano, basil, rosemary, and red pepper flakes. Cover and cook on low for 6-8 hours or on high for 3-4 hours. Note-for vegan, don't use the Parmesan cheese and for gluten-free, use gluten-free pasta. 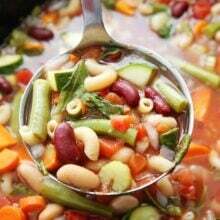 I was looking for a minestrone soup recipe to make for today this looks perfect. Tell Josh to come visit us in CT we are expecting 30 inches of snow by the end of tomorrow. Loving this nourishing, hearty and vibrant veggie soup, pairs perfect with snow. And if you’re looking for snow, Buffalo, yup, we’ve been sledding everyday! 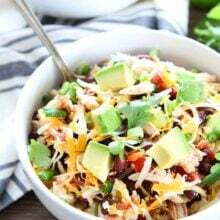 Loving this bowl of easy, slow cooker, veggie, comfort goodness! Totally what I want for dinner tonight AND all the nights! Pinned! Loving all the veggies in this bright, gorgeous soup!! Loving all the veggie goodness in this soup!! Ohhhh what a perfect recipe for today’s cold and snowy day! Thank you!! I always need ideas for the slow cooker! Loving this hearty, veggie soup! This sounds amazing. I have been in a soup kick lately. This is a beautiful minestrone! The fact that it is made in the slow cooker makes me love it even more! 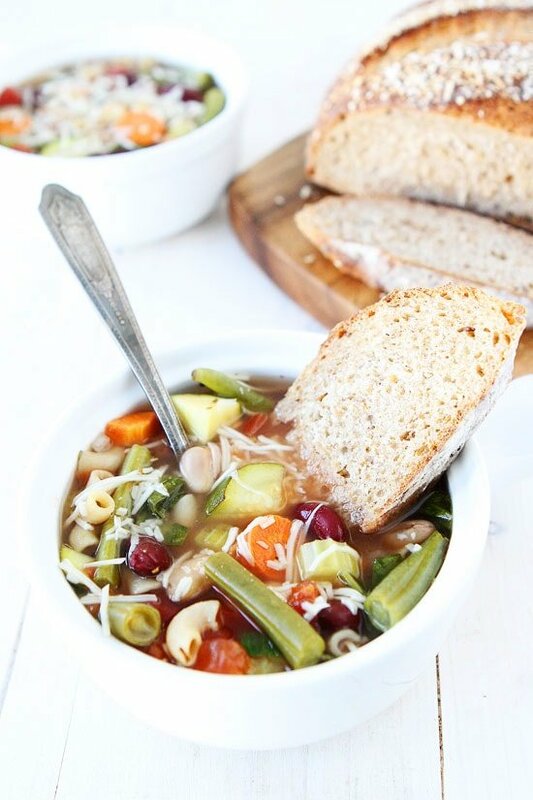 Minestrone is definitely one of my favorites and this looks so easy! Slow cooker soups are the best! Thanks for sharing. This recipe is just in time for the blizzard we are having here in NY. When I went to the supermarket to buy “provisions” for the storm, I had this recipe with me so I could be sure to get all the ingredients. While the blizzard continues tomorrow, my slow cooker will be cooking this yummy looking soup! This is absolutely gorgeous! I could go for a bowl of this right now! You just can’t beat a good slow cooker soup and this one looks so hearty and filling, Maria! I just went yesterday and bought a slow cooker, then thinking about what I want for dinner and it’s perfect weather for minestrone in Australia at the moment …. Then I saw this is my email, what are the odds . This rustic soup looks wonderful! 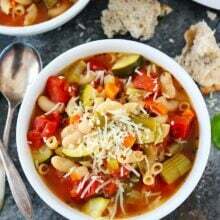 I need this minestrone in my life! I am making this asap! I am seriously obsessed with making soup…and this one looks amazing! I love that it is basically a full meal in a bowl. YUMMMM! Yum this looks so good! I love all the veggies in it! Made this over the weekend and it was delicious. My house smelled so good once it really got going. Only changes I made: fresh rosemary; ditilini (sp.?) pasta and an extra carrot (mine were really small). No parm cheese but it was very good!! Easy to put together since you don’t pre-cook anything. Thanks!! 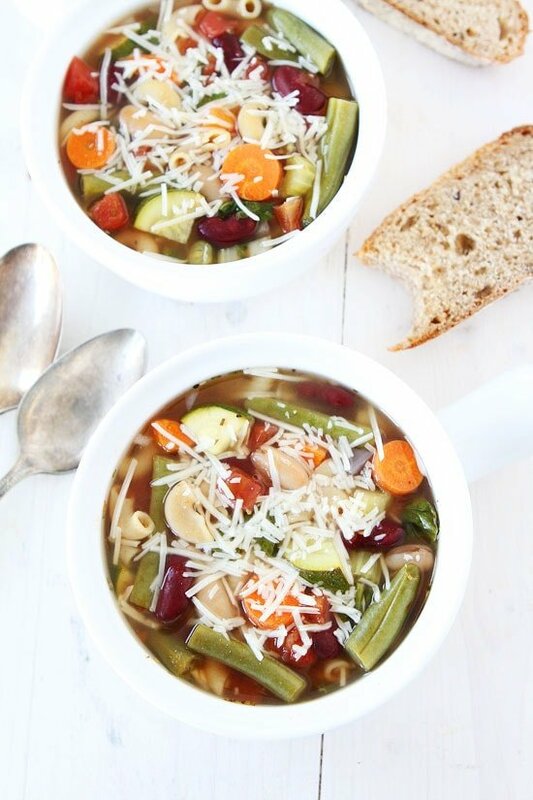 Wow, I’ve been looking for a good minestrone soup recipe and I’ll def be trying this! It’s one of my favorite soups! Finally, a slow cooker recipe with veggies. I feel like they are rare and really hard to get right – the veggies often end up mushy. I will definitely be trying this out! We have tried a few of your soup recipes the past month and all, including this one, are delicious. Thanks for sharing a hearty and simple to put together recipe. The lemon orzo and chicken and wild rice are right up there with all the deliciousness as well! Oh, and we tried one with lime and chickpeas I think… Mmmm! Soups must be your thing 🙂 all so good. This looks delicious! I would make the pasta separately, undercook it, and throw it into each individual bowl of soup as I serve it. Otherwise it will taste like mush. What is the Sodium content for 1 bowl of this soup? I am on a very restricted sodium diet and would love to make this but I need to know what the sodium content is before I can. Thanks for your help. I am not sure on the sodium content. You can use reduced or low sodium beans, tomatoes, etc. Just put this in the slow cooker. Wasn’t sure …. do you drain the cannellini beans? Yes! I updated the recipe so it’s clear. Sorry about that! Enjoy! Just made this on Tuesday and the whole family enjoyed! This is the best minestrone soup we’ve made homemade! It has a taste like the Olive Garden minestrone soup! We left out the green beans and spinach just for our taste preferences, but this was still beyond delicious! This soup was outstanding. It has just the right amount of seasonings. The veggies turn out great, with some firmness. It’s very fresh tasting. I cooked it according to directions, but I cooked the pasta separately and add it as we need it. I prefer the option of not having the extra carbs. Delish and a crowd pleaser! Thanks! This is super super yummy! I’m wondering if this freezes well? I get scared to freeze some veggies for fear they will change texture. Looks delicious! Do you think the leftovers would freeze well? Yes! I freeze this soup. The pasta sometimes gets a little broken up after defrosting, but it still tastes great! I was looking at this and another minestrone soup recipe and they’re quite similar, except the other one calls for 8 cups broth and 4 cups water… Yours calls for just 6. Does this make a fairly think/ dense soup? I wonder if the water in the other recipe waters down the flavour, but still I’m wonder if I use more broth if that means more soup? Thoughts? Oh yumm!!! Loving all the veggies in this soup! Made this soup yesterday, love it! Any idea what the calorie count would be per serving? Can you provide the nutritional content for this recipe (calories, protein, fat, etc.)? thanks! It’s in my crackpot now – looking forward to a yummy dinner! I don’t have the nutritional info, sorry! Enjoy your soup! This soup is incredibly good! My 5 year old, the sweetest little picky eater, asked me to pack some for his lunch to kindergarten!! I’m in 7th heaven haha! Thanks a bunch for the recipe, definitely a keeper! This soup is perfection in a bowl. I used fire-roasted tomatoes to add a little more depth, and my family likes spice so I added about 1 teaspoon of crushed red pepper flakes. Then…. we ate it for dinner, and then lunch, and another lunch, and Sunday supper, and a snack. For me. Yum. Loved the soup, but my pasta overcooked within 20 minutes. I will split the blame with my crockpot and cook the mac separately next time! This looks like the perfect winter soup. This looks so good! I linked to it on my menu plan for this week! i would like to make this into a freezer meal, but should I thoroughly cook everything or leave it slightly undercooked? You can cook everything. The pasta might break down a little after you defrost it, but it will still be tasty! Absolutely a wonderful recipe! Love the healrhy veggies and that it’s made in a slow cooker. So glad I came across this recipe. Making it tonight for the 4th time! 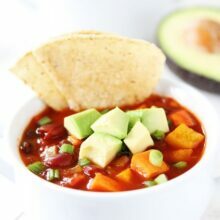 Could I make this recipe without a slow cooker? You can make it on the stove. Making this soup in my slow cooker now! I added a few things; diced red bell pepper, fresh sliced mushrooms, extra garlic, chickpeas, used frozen green beans instead of fresh because it’s what I had, and am omitting the pasta (hence the addition of the Chick peas). Might add a little fresh broccoli at the end if my slow cooker has the room for it! Also added red cooking wine and a tablespoon of apple cider vinegar to brighten up the flavors. Can’t wait to have it for dinner! You stir it in at the end. I have done it once for a friend and it worked. If you are nervous about it, you can cook it on the side. Omg! This is so delish! It’s snowing today and it’s perfect! I used ABC pasta. I didn’t have any oregano so I used 2 tsp of Italian seasoning. I will def be making this again. Thank you! I love the fresh veg in this soup, but it’s also a great use-up-the-pantry recipe if you don’t have everything. I used canned green beans, black beans instead of kidney, and frozen spinach. It was still very tasty. I’m sure it would have been better with fresh green beans, but it really worked even with the canned. An excellent, easy minestrone recipe! Thanks. I love this soup. I always make it on a rainy day like today. Then I can take it to work all week. I love all of the recipes from your website. Keep up the good work. This soup is wonderful, easy to make and delicious. This was really good! The veggies weren’t mushy at all, which is what I thought would happen. It wasn’t a brothy soup, I don’t like brothy. It was just packed with great veggies, beans, pasta and flavor. Keeping this as my new minestrone recipe. Even my extremely picky husband had a couple bowls. Really wanted to love this soup… but it tasted like vegetables in water. I was able to doctor it up a bit with hot sauce and a bunch of seasonings… but that only did so much. I loved how easy it was to put together and was really hoping for a winner with this one.